Chop 4 of the pepperoncini into small pieces. In a medium-size bowl, mix chopped pepperoncini, sour cream, scallions, bacon and blue cheese. Cover and refrigerate 1 to 2 hours to let flavors develop. 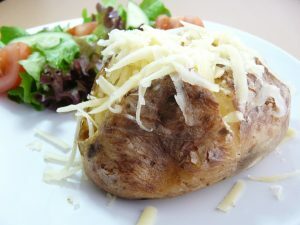 Spoon sour cream mixture onto hot baked potatoes. Serve a whole pepperoncini on the side.